No time to talk, must sew! with a surprise. It seems that a substitution was made for one of my choices. Can you guess which fabric above was not in my order but was sent as a replacement? It's pretty, but I won't be using it for this project. Check out what he's been making. Our mild temperatures and mostly snow-free winter has allowed him to keep up his construction efforts, it appears. Part of this week has been spent sketching out ideas that I want to sew, along with working on some patterns (and free tutorial ideas) that I want to be able to share with you soon. Now if only my sewing speed was faster! Proto-types and proof reading take time, but I'm making progress and being patient with myself. I did manage to transform one of my sketches into a little something. I'm rather excited because it meant pushing myself to explore working with more solid coloured fabrics in my creations. Solid fabric has such impact and I've been enticed by the lovely range of colours now available. It is funny, that I consider it an adventure working with solids because for many years I mainly sewed solids, having been raised with the ideals that you can't combine more than 2 prints together. Hence, that left me using solids with maybe two prints total. Prints combined without a solid to "tie them together" was viewed as a "no, no" in my household (thanks, mom! ;o). Now, if you've been through my blog at all, it's obvious, I'm long past that belief!! 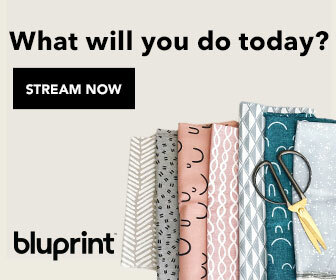 The more prints the merrier, I say, but since I've been bitten by the quilting bug, I've become so comfortable combining prints and have overlooked using solids in my projects for anything more than an backdrop. It's time I put those solids on center stage! I haven't gotten so far as to drop the prints altogether, but I'm dipping my toes into making more use of solids in this recent design. I have a bit more tweaking to do to it, but have high hopes for it. Hopes that include making this simple design into a tutorial I can share with you. I am wondering what are your feelings for sewing with solid fabrics? Are you really adept at it and use lots of solids or are you a bit like me and just experimenting? Which are you more drawn to ... solids or prints? While you're thinking about that, I have to show what landed in my mailbox at the end of this week. I received this gorgeous and inspiring magazine as a prize from the talented Brigitte, all the way from Germany. 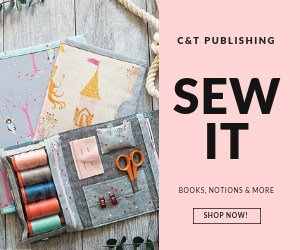 I have been poring over this magazine and admiring the gorgeous projects and inspiring showcase of quilts from cover to cover! Thanks again, Brigitte. Perhaps you don't know her, but let me tell you, Brigitte is a very talented designer and quilter. I first discovered her after I stumbled across photos of her booth at Quilt Market last year. I fell in love with what I saw. She has an incredible aesthetic when it comes to colour (fabulous use of solids) and elegant, clean designs. No wonder that she has two features in this very magazine. One shows her lovely studio in her home (there she is, below... hello, Brigitte!). The second is for a Zen Chic project - a beautiful table runner that Brigitte designed. Can I tell you how much I love her brand, Zen Chic! I want to encourage you to go visit Brigitte at her blog, Farbstoff. You will be inspired, I promise. One of the regular features she blogs about is choosing colours. She puts together the most gorgeous palettes, selecting her colours based upon an image of something in nature or even in the man-made world. 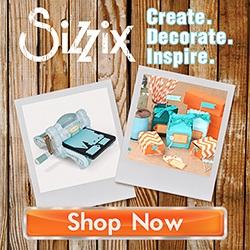 Brigitte also has an online shop with modern designer fabrics, here along with patterns and kits you can purchase. Happy Sewing! I thought about making them into a bunting for my sewing room, but then I accidentally ( um... this happens when I have several projects spilled out on the table at the same time) came up with adding pretty buttons, to make them extra special. Then I remembered I had a package of jewelry pin backs gathered from a thrifting foray. A few quick stitches later, I can now pin my colourful hearts to bags, collars or whatever I fancy. Thought I'd share the idea with you, in case you need a quick, simple gift. On another topic... having read other posts about the annoyance of having 2 ( sometimes very, very hard to read) words to enter to prove you're not a robot when leaving comments on Blogger... I decided to shut off word verification on my blog. Within 24 hours, I was spammed, more than a half dozen times. sigh. Feeling frustrated, I've turned the word verification back on. Anybody know a way around having to use word verification that doesn't invite spam? over at Sew WE Quilt today! Please, come visit. 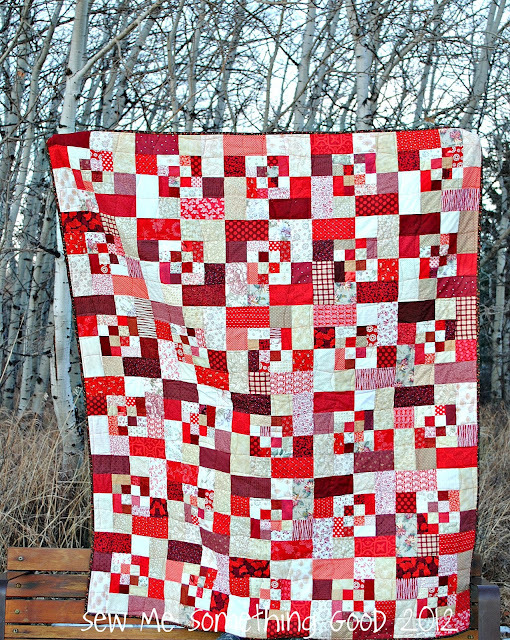 I'm sharing a couple of my tutorials and showing some new pics of my quilt, Pretty Please. Doesn't feel like Tuesday today. I guess that's because yesterday was Family Day here in Alberta, so now I'm one day off this week. ;o) I do wish that extra day to the weekend meant I accomplished more sewing, but it didn't. Instead I enjoyed a long weekend of family time, which I cherish. Anyways, with so many WIPs stacking up around here, I shall divert you with the contents of a pretty parcel that I received. Almost a month ago I was one of the lucky few to take part in a charm swap featuring polka dots, over at Craftbuds. Glorious dots in a rainbow of colours and sizes... all from Sew Fresh Fabrics. 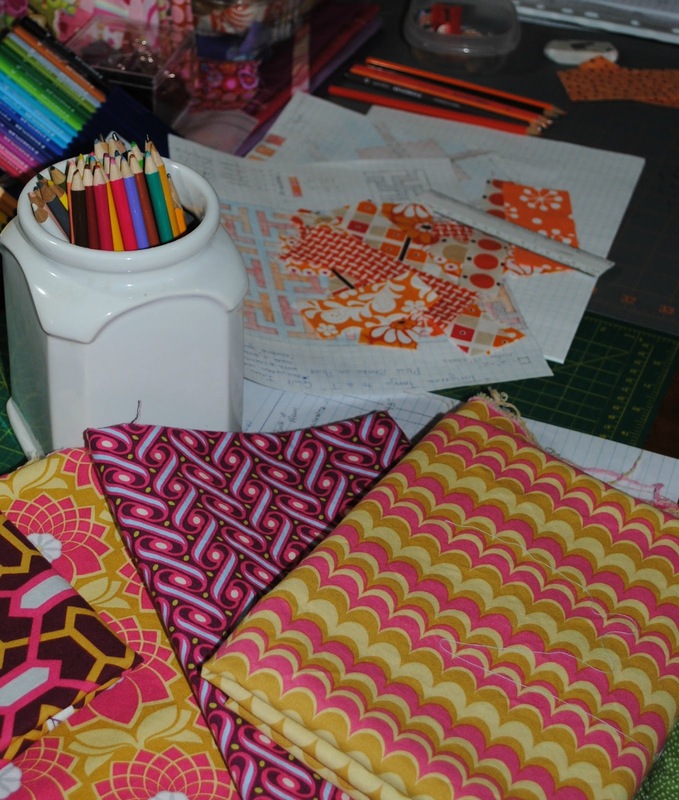 Many thanks to Peg and Becca for cutting, packaging and posting all these lovely fabrics from their lovely fabric shop to the homes of every swapper. Wow. 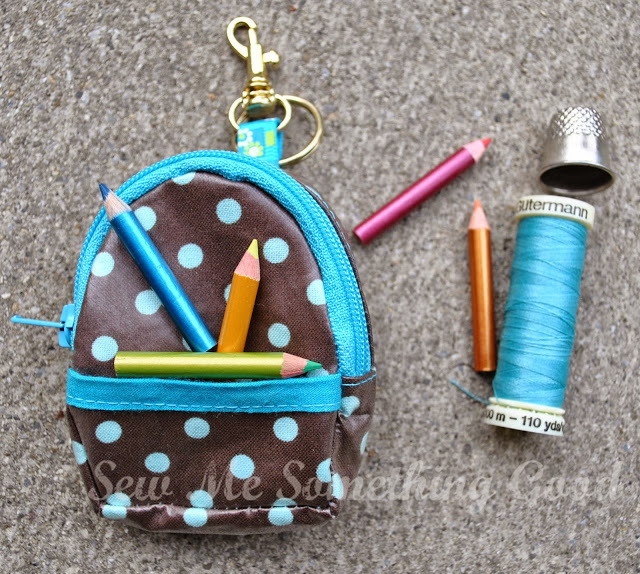 I'm loving that I have 2 charms of 28 different dotted fabrics to play, admire, create with! This swap was so well organized... I wonder if they could be convinced to do this again... they have some dotted fabrics that didn't get chosen for this swap and who wouldn't like more dots? My newest design... the One Heart Reading Pillow! The shape of this pillow is perfect for reading in bed due to it's triangle shape which keeps your back supported. Although I've made this style of pillow before, I started out with the idea of piecing a heart from scraps. A year ago, I drafted a heart shape, then paper pieced red/pink/white fabrics together and hand appliqued them to the white background fabric. The whole pillow was white and I was going to cover it with free motion quilted writing. Then I changed my mind and the project was put aside. A new year, brought me new ideas. I realized this would be a perfect opportunity to use my burgeoning button collection. Once I sorted out which buttons I wanted to use (avoiding any with shanks), I used a dab of fabric glue to position the buttons in place. The purpose of using washable fabric glue? I wanted to temporarily hold the layout of those buttons so that I could machine stitch them in place. I've sewn buttons on using my machine for many years now, although this is the first time I've used glue to hold buttons in place before sewing, but it worked quite well. Check out the button love! The next new idea for the pillow was to eliminate all that white! I decided the back of my reading pillow could be made using red and cream pieces left from my Pretty Please quilt, supplemented by pinks from my scrap bin. I was trying to repeat the colours used for the scrappy pieced heart in pinks and reds on the pillow front. Circles were quilted on the red/pink zig zags, while the cream fabrics were quilted with the word "love" running across the width of the pillow. A fun way to practise some free motion quilting! Figuring out how to quilt the pillow front had me stumped. Every idea I sketched up got tossed aside until I remembered how I quilted my Forgotten Charms quilt. I loved the texture those swirly "S" shapes made, so that became the quilting design outside the heart on the front. The underside of the pillow is a solid piece of fabric, rather than patchwork. I do love how this tonal print ties in with all the patchwork fabrics. Can you see the hidden zipper that makes this cover removeable? One Heart is made up of so many of my favourites...pretty scraps, buttons, polka dots, pinks with reds... sigh... that I'm looking forward to putting it to use the next time I want to settle in to read a favourite book. I'm linking up with Fabric Tuesdays over at Quilt Story. There have been some questions about the pattern for my pillow and due to the interest, I'm seriously considering making it into a PDF pattern and selling it. I need your help in deciding. I'm thinking of giving several options for it. One would be basic (no patchwork) and perhaps a couple other versions. 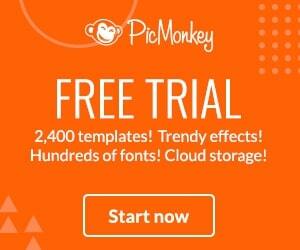 Would you like the pattern to be in a tutorial style or would written directions with a few pictures work best for you? 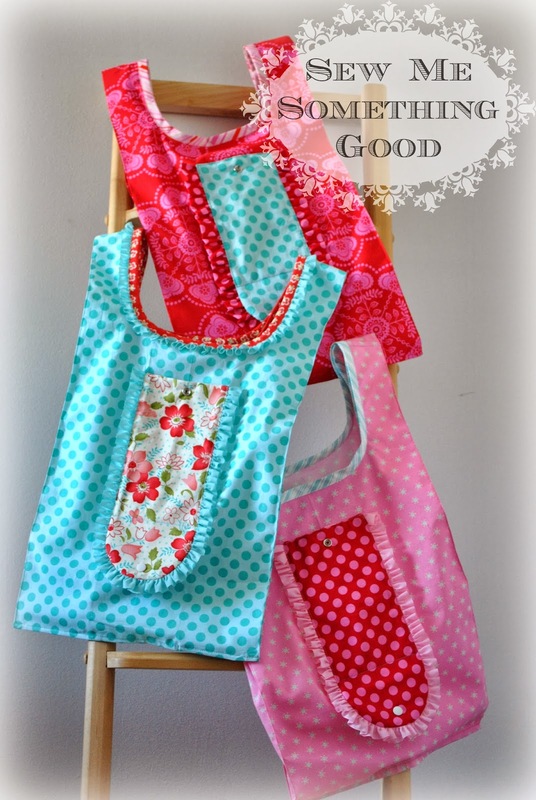 I could include instructions for the patchwork plus applique as well as how to make your own piping. What do you think? Thanks so much for your lovely feedback. I really appreciate it! PS...Rachel, as you are a no reply blogger, I couldn't answer you directly. One Heart is a pillow cover(it has a hidden zipper), which means I also sewed and stuffed the pillow insert that fits inside the cover. Hope that helps. **** Thanks for your feedback. I have a reading pillow pattern available in PDF format at Craftsy. 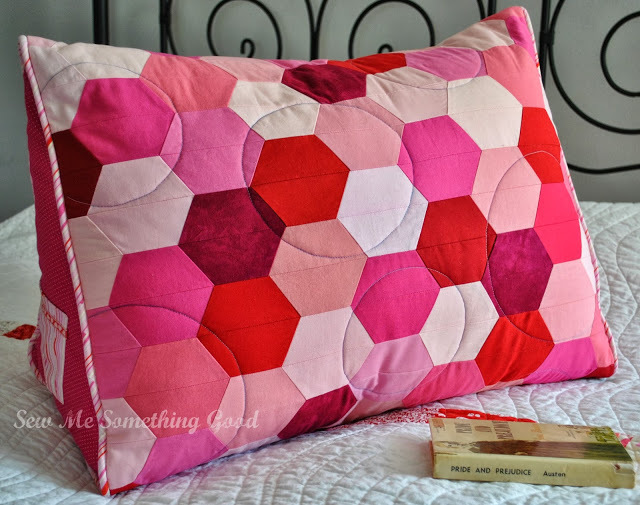 The shape is the same as the one heart reading pillow, but instead of a heart, I've re-designed the pillow to be made using pre-cuts to form hexagons. It's Friday and I've got a finish to share! I'm linking up with friends over at Crazy Mom Quilts (be prepared to be inspired by great finishes this week). I completed the motifs in December and then put them aside to await blocking. Earlier this week, I finally got out my steamer and blocked all those colourful motifs. Blocking did make a noticeable difference in the appearance by opening up the design and making sure each will lie flat. Ridiculous how long I managed to put off this necessary step. The pattern for these colourful doilies is in Linda Permann's book, Crochet Adorned. The book is full of inspiring and modern crochet projects that will have you wanting to pick up your hooks and yarn. It's a fantastic book and one I hope to add to my own library. What did I finally make with those doilies? It now resides on a side table in the living room where the colours complement my Sparkle Snowflake cushion and the matching Snowman cushions. Nothing like bright colours to liven a snowy, winter day! I may come to a decision about the layout for my Orange Twirl Quilt. All the blocks are sewn, but I'm not sure if I'm completely satisfied with the arrangement of them. I think it's because I've thrown in a few extra orange prints (in order to have enough fabric to make this lap sized) - ones that maybe grab the eye too much? My goal is have your eyes travel the quilt, see the contrast, recognize that there's a pattern and still find it interesting - in a cohesive but not boring way. I don't want one area to overwhelm another... which can happen when you have fabrics that read bolder than others (which is why I limited the use of brown in this quilt... your eye is immediately drawn to that fabric). Let me say, that I do enjoy the challenge to find an interesting balance when I lay out fabrics for a quilt, but sometimes this part of the process takes more time before I feel that I have it. So I realize I need to just step back from working on it and see what strikes me when I look at it. I whipped up some teeny crochet hearts and then I grabbed a couple of granny blocks and played around with adding chocolate brown as the background colour. A colourful diversion, which I hope leads me to deciding the final layout for my quilt. between several projects this week, I've also managed to lose some time on Pin interest. Ack. All that pinning sparked more creative ideas, which means more projects I want to make, so there's a mess happening in my sewing room at the moment. Looking at what I've pinned, it should come as no surprise that a few new crochet granny squares are underway. I just can't seem to get enough of bright colours right now. Finished blocks are on the left... waiting to be pieced (with one block at my sewing machine at time of photo) are those on the right. to being two-thirds finished. Although the piecing does take a little time, I made it longer because I kept playing with the layout of the fabrics and even cut new ones to add some spice to the mix. ;o) I'm pleased with the look so far and fingers crossed I will finish piecing today. The last project I'm sharing today, is one I am so close to finishing. I crocheted up different sized motifs in 3 different colours for a project near the end of 2011. It's been waiting for me to block it before I can assemble it. Not hard, right? But it meant I needed my whole ironing board to use as a pin board and that meant not being able to use my ironing board for anything while I was blocking my crochet. Lame excuse for not blocking sooner, but that's me. ;o) Anyways, last night I pulled out those motifs and grabbed some straight pins. Please excuse the ugly steam stains on my ironing board. Can you believe I made this cover new about 6 months ago? I guess that reveals just how much I use my ironing board! The good news is that as of this morning, all those motifs have been blocked. Time to stitch them together. It would be good to have at least ONE finish this week. ;o) What are you working on this week? Thought I'd let you know about a challenge taking place here, in case you want some orange inspiration or would like to enter in on the fun. I hope to finish the Orange Twirl quilt in time to enter this challenge which is open now and will close March 2, 2012. Click the link above to find out more! Now that the day's work has been done, I'm off to piece more blocks before bed! and then like this.... This design really relies on contrast, so before I started, I tried to place all the fabrics in stacks of light or dark. That helped, but it often takes standing back from the layout and viewing the arrangement from a distance or taking a photo of the placement to really see how the colours are interacting with one another. You can just see some of my crazy 9 patch blocks on the left of my design board. All necessary blocks are made... but I'm still waiting for my hubby to contribute some of his artwork to be included in the quilt top before I can go further on this quilt. It's the middle of the week. Again? then some free motion quilting. Variegated thread is always fun to play with! Soon it was time to shake out the button box for another idea! A dab of washable glue to temporarily hold each button, before I machine stitched them into place made things much easier. Whew. That was a lot of buttons to stitch! Want to see what my friends have been making today? Click through to find out!